This was somewhat inspired by Alfred Wong’s Pirate Y-wing model. 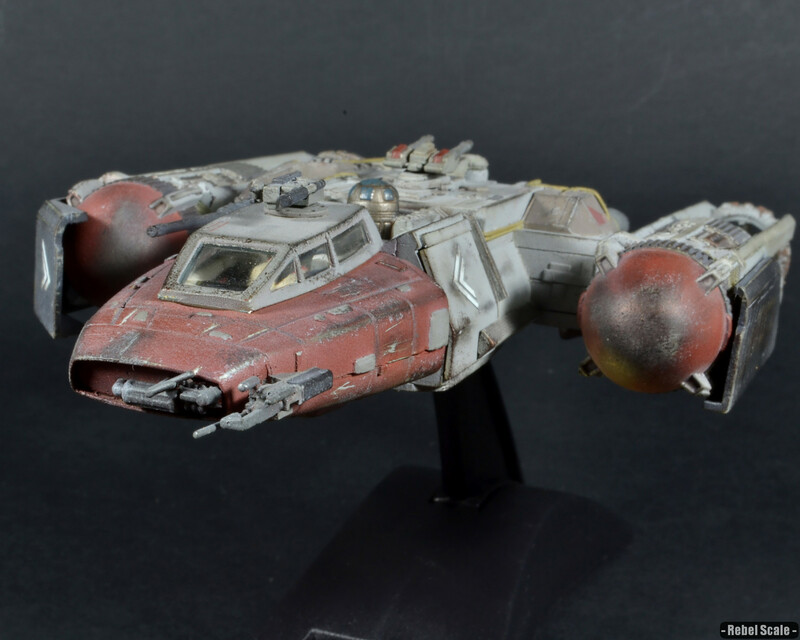 His, however, was more of an “ugly” themed kit-bash; I wanted mine to look more freighter-like in appearance. 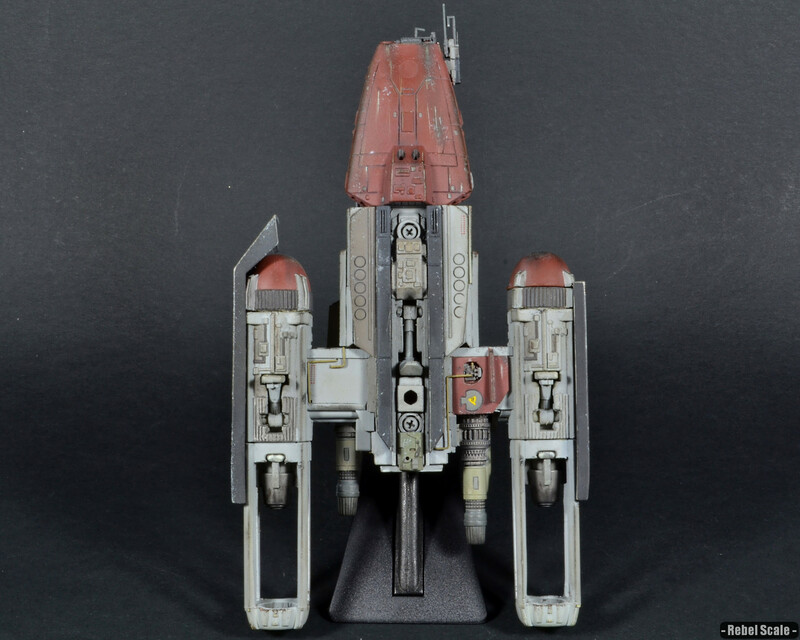 I started with an AF Y-wing. The upper-body and cargo compartments came from pieces from the AMT AT-AT and Snowspeeder respectively. 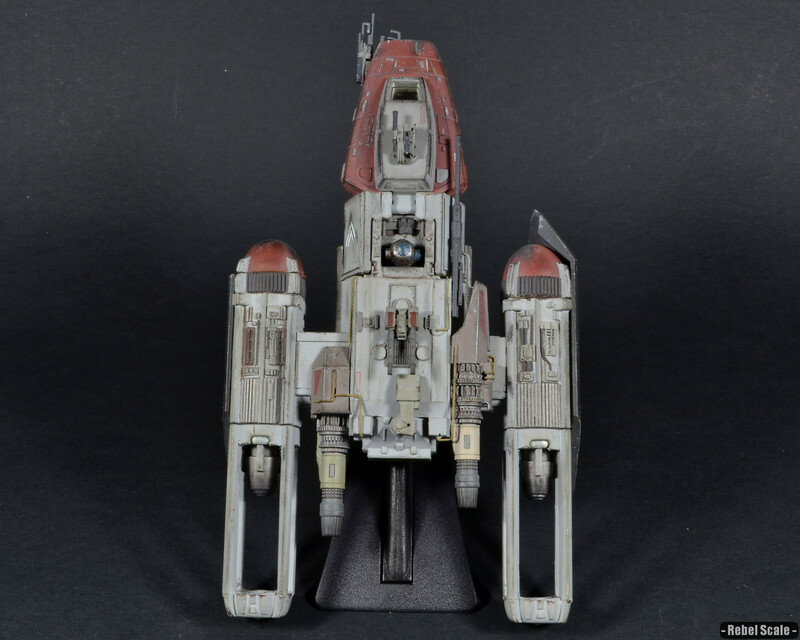 A Revell Pocket Kit ARC-170 provided the engines and side generators, whereas an AMT Corporate Alliance Tank Droid provided most of the armored plates. I used small brass wire for all the yellow power lines. 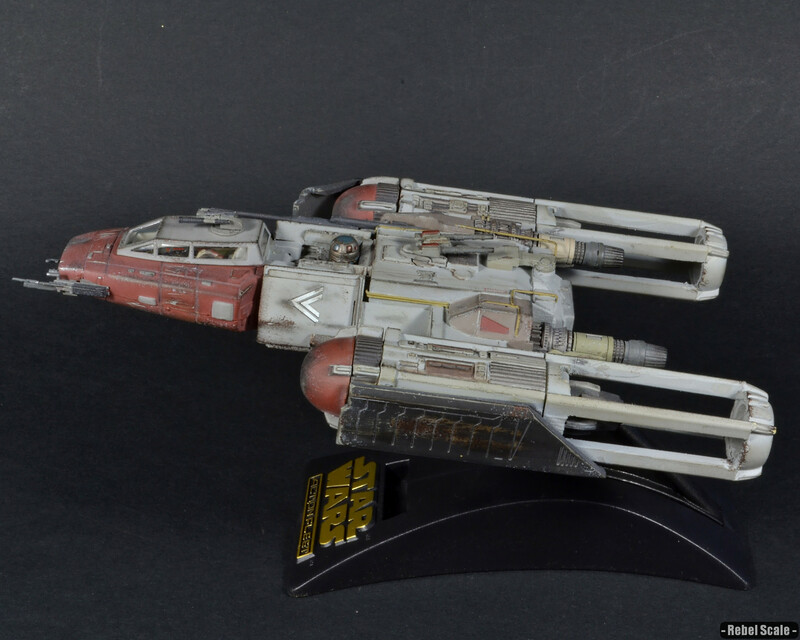 Also, I enhanced the nose of the Y-wing to look more accurate by adding thin styrene and Tamiya putty. I finished it off with some random tank pieces for details, and German WWII guns for Star Wars guns (which are a bit too big for the figure’s scale). Painting was a combination of a light grey and Model Master Rust, which is more of a burnt red color. I did some heavy weathering on this beast by creating chipping all over, battle scaring, and use of Tamiya Weathering Kits to get the panel edges darker. 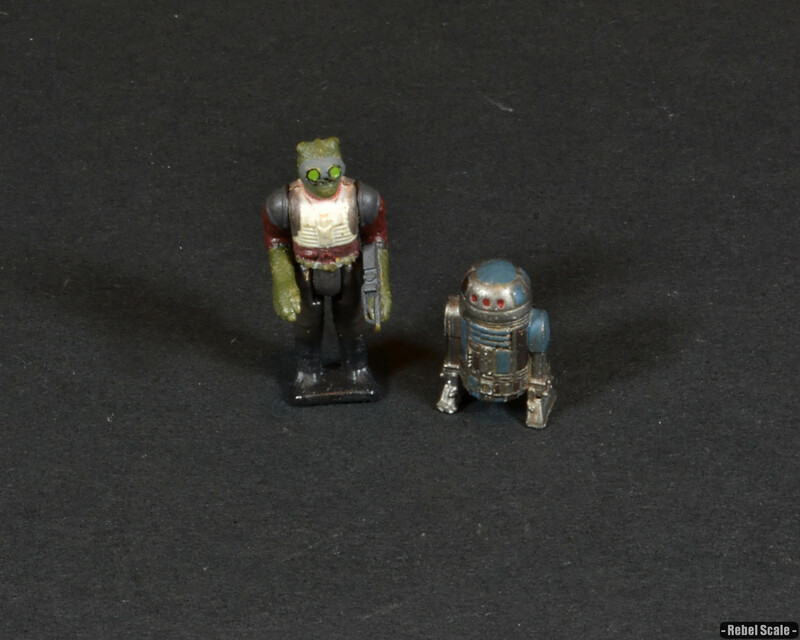 The figures consist of the Y-wing R2 unit and the bounty hunter Bossk, with brass wire/small parts replacing the gun Bossk usually carries. 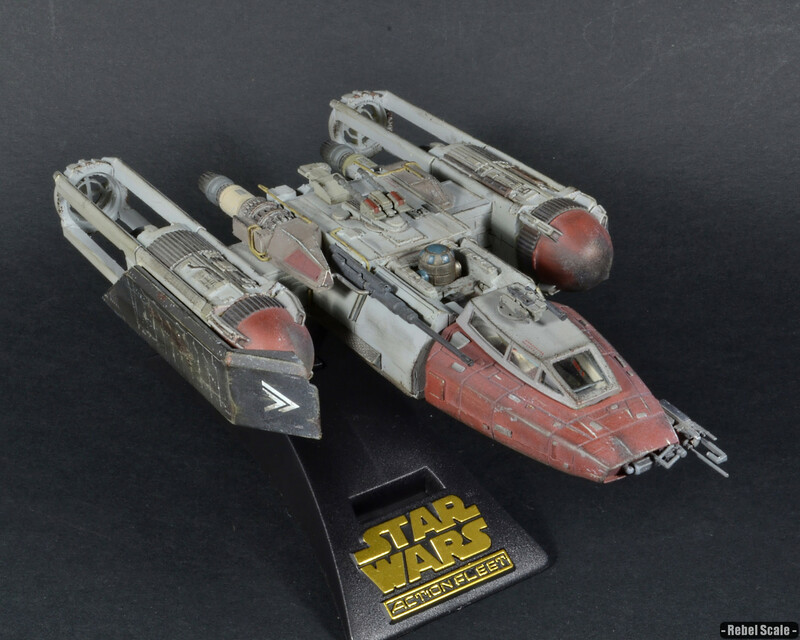 Originally a cumbersome Y-wing bomber used by the Rebel Alliance, the refitted Riven became a fast and powerful craft utilized by Trandoshan computer slicer Drissk. Unlike most of his race, Drissk was more interested in technology than scalping. After leaving his homeworld at a young age, he made credits where he could as repairman, usually fixing items beyond their usual capabilities. During these years, he worked from secluded stations in the Outer Rim, yet took contracts from both Imperial and Rebel groups, feeling that only the cash mattered. However, neither group held much respect for Transdoshans, leaving Drissk shortchanged on more than one occasion. A few years before the Battle of Yavin, he arranged a little skirmish between the Imperial and Rebel forces by hacking into both military channels and relaying the signal for an Imperial supply run to the opposing side. The Rebels took the bait and attacked a rather large convoy with Y-wing bombers and other Clone Wars era fighters. Both sides suffered heavy losses allowing Drissk to move in after and scrape up the remains. Among the remnants were 5 Y-wing hulls, 3 ARC-170 hulls, a damaged Corellian freighter, and tons of debris that would be useless to all but the most resourceful tinkerer. 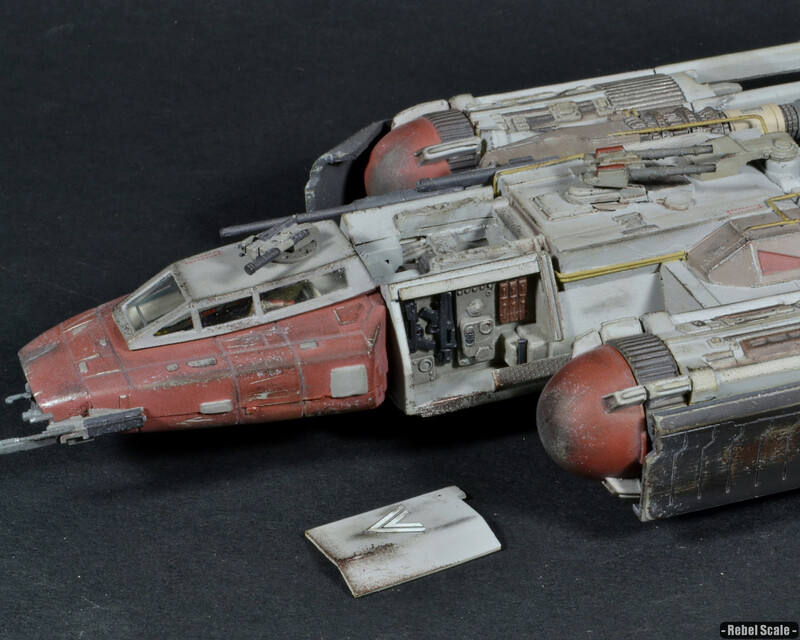 Drissk was able to rebuild a Y-wing from the remains. 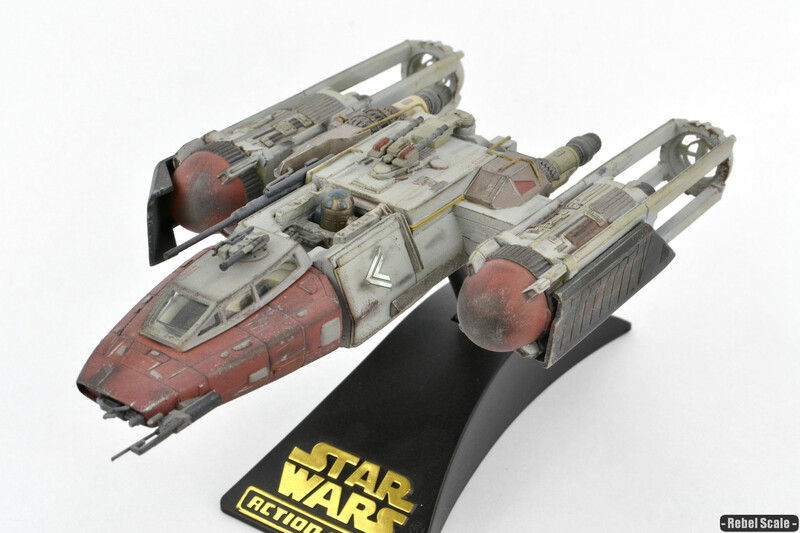 He added two engines and power generators from ARC-170s giving the recently named Riven a much higher speed. Bolstering its performance was the use of external power lines, bypassing any regulators and providing the ship's systems with a direct feed from the multiple power cores. The damaged freighter provided additional cargo space, as well as much needed armor plating that doubled as maneuvering fins for atmospheric flight. 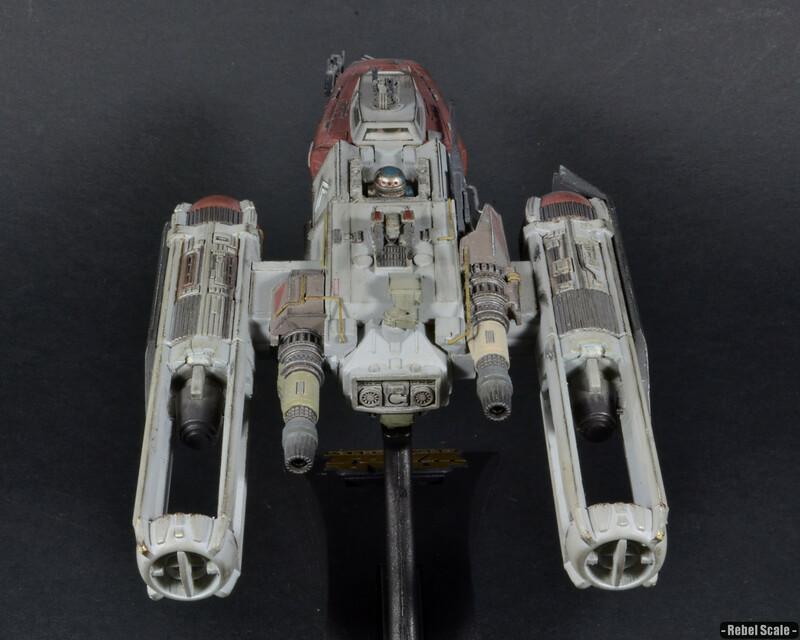 The reconfigured defense systems included an augmented shielding system, a dual rear-facing blaster turret, and a single military-grade laser cannon, which Drissk tweaked himself for better range and accuracy. Due to his physical size, Drissk had to remove the internal targeting system, which he reconfigured and bolted to the nose of the Riven. 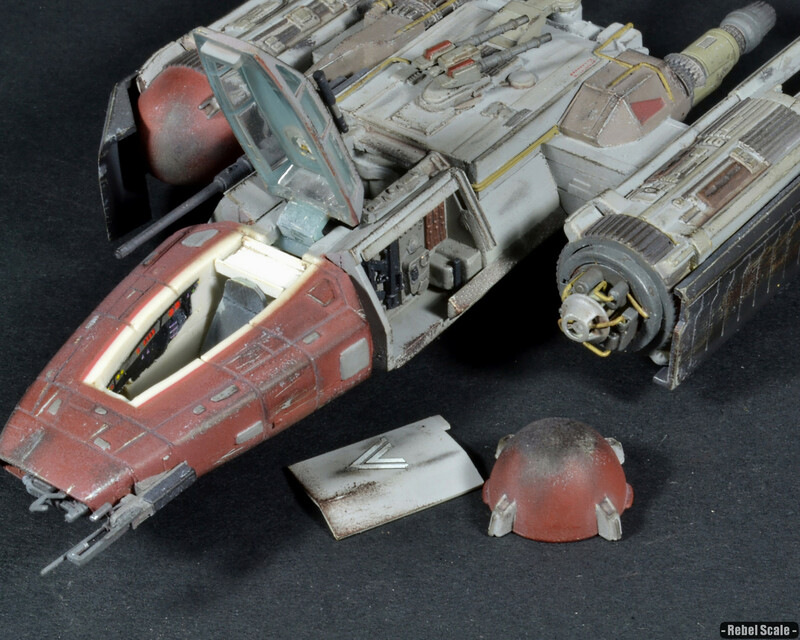 For back-up, he resurrected a downed R2 unit, which would aid in flying and controlling the rear turret. However, the most impressive systems were the many surveillance and slicing systems he added. These included a line-of-sight scanner/jammer turret with the capability of hacking most low-level computers, long-range receivers for interrupting transmissions, an on-board transmitter for rerouting signals, and several sensor masks for stealth operations. With the power feed controls, Drissk could activate or deactivate any system to boost power for whatever his needs were at the time. Drissk finished the Riven with an array of computer systems, which he controlled from the cockpit. Because of the Trandoshan's limited dexterity, Drissk enhanced his left arm with cybernetic systems, allowing him far greater flexibility and control than before. With the Riven at his side, Drissk continued to act as an interstellar communication pirate, stealing and selling information to the highest bidder without ever taking a single scalp, although he might take offense to such a non-threatening description.